This is not my first Grateful Dead themed beer. I'd like to say I was a fan of the Grateful Dead, but I honestly just never got into them. It's not that they were off-putting or anything, they were just never in my wheelhouse. Beer, however, seems like where our two roads might meet. And this beer from Bloomington, Illinois might be the crossroads. The beer isn't as red as I would've expected. Instead, it's more of an amber that has a brownish-reddish tint to it. The head is kind of fun, though. It's all bushy to start with, and it boils down to a nice, thin layer of moss across the top. There isn't much lacing, but at least there's some. 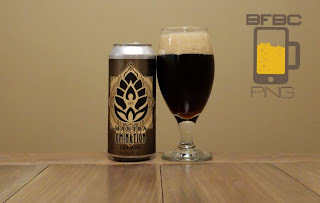 The aroma is very sweet and citrusy, but it has some caramel malt and tropical fruits that are giving it a body unlike pretty much any beer I'm able to remember. I'm generally not a fan of Octoberfest/Oktoberfest/Märzen/Festbier (could some international authority standardize the name of these beers, please? What to we pay the UN for?) beers, but this is a Bearded Iris brew, so I expect a cut above. That said, this has a pretty pedestrian 4.6% ABV, so I don't know that there will be a whole lot of "fest" really going on here. The clear pale gold beer has a healthy head that is like a giant pillow. It eventually dies down to a nice, uneven layer that flows into the lacing strewn haphazardly around the sides. The aroma is almost stifling with yeast, vanilla, and some hops that almost seem soured. It's a strange aroma, but Bearded Iris doesn't normally lead me astray. I got this in a four pack, and I gave one to a close friend of mine. He tried some other beers that I had given him with it, and he had not been all that impressed. But, he sent me a text with a picture of this beer in it and said he was a fan. Now, he tends to be pretty scrupulous with his beer drinking, so I have high expectations for this joint venture between Surly and First Avenue. Didn't really give me a whole lot of head to work with, but the bubbles cling to the sides pretty well. I'm expecting at least some lacing. 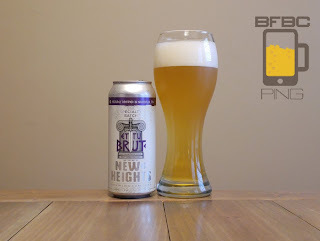 The aroma is just about what you'd expect for a blonde, as it has a lemony front-end with grains and a cracker-biscuit malt. The presentation on this beer is pretty darn good. It's exactly what I expect to find in a blonde. Earl Grey seems like an odd choice. I've had limited exposure to teas in general, and I know that one of the ones that is really full of personality is Earl Grey. It's not for everyone. Even the people I know who like to drink tea tend to stay away from it pretty hard. But, as an ingredient in a beer, it just might work out, right? I mean water is pretty tasteless and bland, but it makes the base for even the best beers. 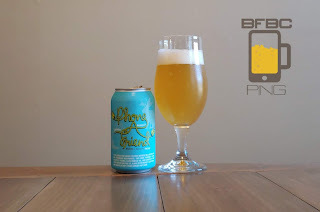 The appropriately named blonde ale has a yellow-gold color with a thin white head that leaves little more than a dusting in a single pad in the middle of the glass. A microscope would be necessary to find any points of nucleation in the depths of the glass. The aroma is solidly blonde with the sweet malt and an indefinable tanginess with that tea riding the wave. This is the first time I've had a beer that has called itself and Imperial ale. Mind you, that doesn't mean that I haven't had others of the style, but they tend to slap Imperial in front of some other descriptor like IPA. This particular beer is a seasonal product, and it's not surprising given that it has cinnamon so prominently shown on the label. So, this is a good beer for a cold night, and tonight is such a night. The fairly clear brown beer doesn't have a whole lot ahead to begin with, and it eventually just becomes that familiar ring of bubbles around the glass with a lily pad of very thin bubbles floating in the center. The aroma is certainly chock-full of cinnamon. 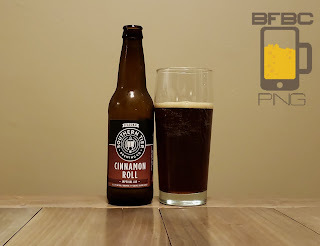 It has some spices and maybe some caramel malt to go with it, but cinnamon is certainly the reason this beer exists. This claims to be "first in flavor." It is a bold claim. I have had many different beers in my time, and many of them were really flavorful and good. So, maybe they were only comparing themselves to other brewers in the Chapel Hill area. Maybe they were comparing themselves to every maker of food or drink ever. There's no way to really know. The gold-amber beer was pretty reluctant to reveal any kind of head, but we got there in the end. The head that we get as a result is still pretty thin, but it's a nice kind of dusty off-white with patches of big bubbles surrounded by a sea of small ones. The aroma is as reluctant to come out as the head was, but it's light citrus with a doughy bread malt. As I write this review, I am waiting for the final season of Game of Thrones to start. As such, I figured I would grab this bottle off of the shelf where it has sat, unopened, for a little while now. Why has it sat after I very much enjoyed Ommegang's other beers? Because this is a blend of a porter and a kriek, and I fear that this will be sour. The beer is quite dark, but it's not black. It's a very dark red, and it is skirting the edges of being opaque; even in the center of the beer, light can still eek through. The tan head is voluminous at first and has big, fluffy bubbles that are downright playful. Later, as the head boils away, only tiny little bubbles float in uneven circles around the top of the beverage. The aroma is a little bit cherry soda and a little bit moody, earthy smoke. Depending on who you believe, this is a Belgian ale, a saison, or possibly a farmhouse ale. Here's the thing: they're all the same kind of beer. Did I just blow your mind? Why the hell do they call the same kind of beer three different things? My guess (and I have a rule against doing much homework for this site) is that the Illuminati use the various names to send signals to each other. 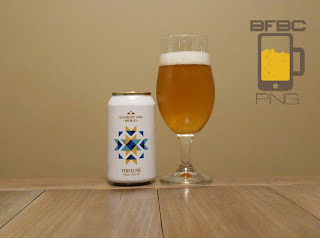 The beer is a predictable clear gold with many delightful points of nucleation leading to the nice, pillowy head that is a bit cattywumpus, but it's got personality and girth in the right spots. The aroma is wheat, yeast, melon, and possibly more yeast. It's a Belgian yeast, so it's quite pungent and has a lot of character. First sip is very nice. It's daunting, but that is to be expected from this kind of beer. Raisins are meeting the yeast and grains to form a strangely creamy middle, but the character is definitely in-your-face and makes no effort to apologize for it. I've had two white stouts before. The first one I was not a huge fan of, as they put coffee flavor in it without me looking. The second one made me wish ill upon a Fat Orange Cat. So, not a great record. 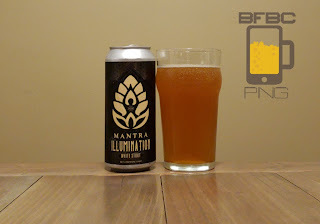 Will Mantra, a brewery that I have a particular fondness for, be able to turn the tide? Let's all hope. It's still odd to look at a stout that isn't some shade of black. I know it's just a thing I have to get over, but I can't help but think that this might be a better beer if it was the right color. As it is, the color is particularly coppery with almost no head. I tried to get as much head as I could coax out, and the pittance that you see in this picture is the best I could to. The aroma is an interesting sweet caramel and apple pie malt that has been resting in a whiskey barrel. Ah, Stone. These guys have been on the short list of reliable brewers for a while now. Aside from a time that they tried to combine their efforts with other breweries, they have managed to stay on my good side. This is fortunate for them, as these tend to be very expensive beers, as beers go. 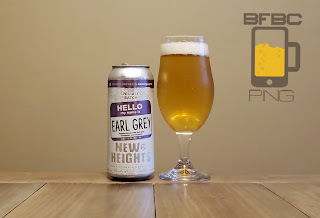 Pale gold and clear are not the two things I associate with an IPA these days, but that might be my choices having an influence on my expectations. After all, not every beer is going to be like what Bearded Iris brings with the juice-like orangeness. 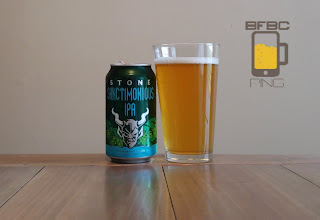 The head on this is also not what I expect (or want) from an IPA; it's hard to bring out and becomes little more than a mote of dust across the top. The aroma is pretty darn good, though, with citrus and tropical fruit meat on top of a very weak bread malt. Two other Damguday beers have gone bast my lips. The V was fantastic, but the VI was a little lackluster. I'm thinking that the world works in mysterious ways, and if I go in reverse order these beers might get increasingly better as I go back in time like Marty McFly. I normally start with the color, but the aroma of this beer is quite pronounced - to the point that I can smell it from several feet away after a couple of minutes. This is not to say that the smell is bad; quite the contrary. The aroma of sweet malt mixes with citrus goodness to make a doughy bowl of enticement. The color is a very hazy medium gold with a very thin head with no penchant for lacing, but the aroma makes up for a lot. 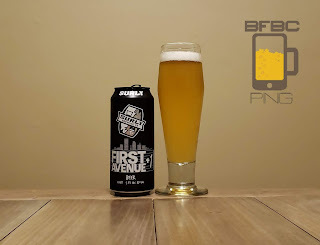 First sip is simple, crisp, smooth, and it has a slight bitterness on the tail end that ties off the sip nicely. If I were to sip this beer all night, I would imagine that I'd be happy, but we all know I don't roll like that. It's time for a swig. I'm not hitting these things in order. I just had the Damguday V, and I loved that thing. I can only hope this beer is better than it. Yes, I know the VI is after V, but I also have an IV to get to after this one, so I figure I will give the three or four of you who bother to read these a little heads-up about my flaky order. It's not the way I like to do it, but this is what I'm saddled with. The yellow-amber beer gets a nice, thick off-white head that takes a while to go down and clings to the sides of the glass like me clinging to the last beer in the cooler. The aroma is malt and citrus, and it is quite enticing. First sip is not great. It's very harsh with heavy acid, the yeast is strong, the malt almost tastes off, and the bitterness lingers longer than the drink has any right to bring. No, this is not a sipping beer. My first MadTree beer, but not my first Jackalope. It's like the Cincinnati brewer went out to find a Nashville brewer to specifically target me with a beer. Folks, I'm touched by the respect you're giving me with this move, and I shan't shy away from the task you've clearly given me to review your beer for the massive crowd of... let's say 11 (okay, 5) regular readers. The beer is distinctly yellow (despite the more brassy-looking picture). This is one of the yellowest beers I've ever seen, and the head is more IPA-like than Pale Ale with a thickness and stickiness that leaves lacing more than many of the IPAs I've had. Admittedly, the bubbles are bigger than an IPA, but that's not of significant consequence to me right now. The aroma is sweet, floral, and a mix of tropical and citrus fruits. 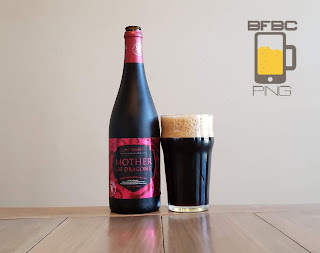 Five years ago, when this blog was in its earliest days, I posted a one-line review of the ale from these guys, and I liked it enough to give it a 4.0/5. My scale hasn't changed since those days, but I would've sworn I had at least one other beer from them, but I didn't record it if I did. So, on to the one I picked up (and if this goes well, I may go out of my way to get the others). There is a great clear, copper color on this beer. The head is a bit of a letdown, and it fizzles out pretty quickly to become little more than a dusting. The aroma is definitely vanilla cream added to an agave sweetness. It's possible the vanilla is going to be too much for this beer, though. Okay, New Heights, I get it - you feel like you can name every beer whatever you like. You're not wrong. I'm not sure about the V - as the IV was a NE-IPA, and this is a "Hazy" IPA. BUT, that beer was really, really good, and I want to believe that you have more of that goodness in you. The cloudy, golden beverage doesn't have much of a head, but I guess it leaves a little lacing as it goes down. I'm absolutely smitten with the profile of the aroma and all of its peach, apricot, tangerine, nectarine, and pine. This aroma smacks you on the nose, but it doesn't because it's playing - this isn't an assault. First sip is a good one, but the back end is a bit of a mystery. 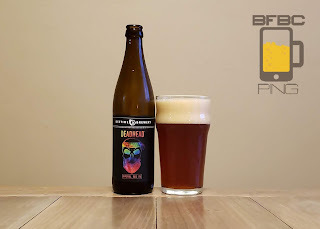 While the front is sweet and filled with all those delicious fruits, the back end seems to bring the bitterness and even a little sourness or liquor style finish. I could probably sip this for quite some time, but I'm not gonna. 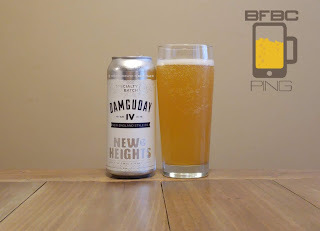 I haven't yet had a bad beer from New Heights. The closest I have come is a 2.5/5, and that is right in the middle of average for my scale, so it's not bad at all. 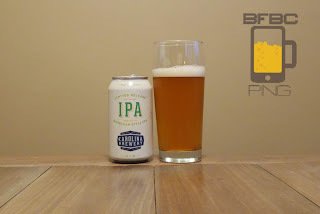 This is their take on a West Coast IPA, so it should be a good one - I like that particular sub-style of beer. The pale gold-yellow beer doesn't have an extreme head, but what it has is thick and leaves lacing, so life is going pretty good. The aroma is bright and shiny pear, apple, resin, and citrus. This sure does say west coast IPA to me with the sweet and crisp scent, but the San Fran-specific aspect is still a mystery to me. I'm not sure beers can really be that hyper-local in style. First sip is tart overall with a swing of sweetness that starts low and goes high by the end, bringing on a bitterness to the tartness. 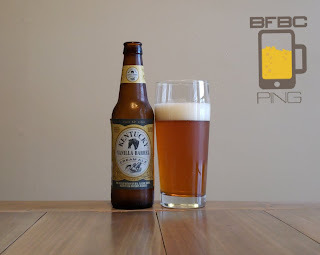 The taste is more unscrupulous with a heavy resin, pear, apricot, and grains aplenty.